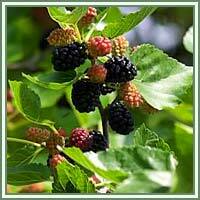 Habitat: Black Mulberry is native to eastern and central China. 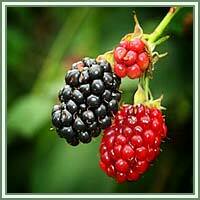 Description: Black Mulberry is a deciduous tree, growing 10 to 13 meters. It has a dense head of branches, springing from a rough trunk. Leaves are thick, blunt toothed and lobed, with short, stiff hairs on the upper surface. Berry-like black fruits have a unique and refreshing, sweet taste. Useful components: Glucose, protein, pectin, tartaric and malic acids, ash. Medicinal use: Traditionally, Black Mulberry has been used in cases of kidney disorders, fatigue, anemia and premature hair graying. Now it is commonly used for its antioxidant and laxative properties. It is considered to be beneficial in cases of urinary incontinence, vertigo and constipation. It is also used as a blood tonic.